Written by Susan Alvaro. Posted in Europe. This Spring, my husband and I took a long, leisurely trip that started with a cruise to Barcelona and proceeded by train, staying in small towns on our way to Paris, and then via the Chunnel to London. We went with First Class; unlike plane tickets, the price difference between first- and second-class on the trains is minimal, but the comfort level difference is huge! Who wouldn’t want large, reclining seats with lots of leg room, tables, and huge windows on a long trip? The trains were really comfortable, there was plenty of food in most stations, and there was food available on all trains except the short local ones. The restrooms on the long-distance trains were plentiful and comfortable, although I did not notice any on the local trains. 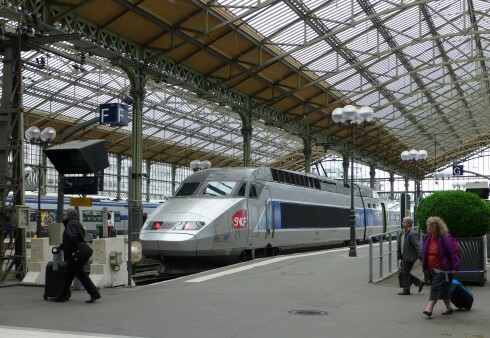 There is a new, high-speed train between Barcelona and Paris that takes only a few hours, but we were meandering through France, so we needed a number of train trips. We had a wonderful adventure and thoroughly enjoyed the train journeys, but it did take some careful planning ahead to make it all work. First of all, we each bought a First Class, flexible, two-country Europass, which allowed us ten days of unlimited travel in Spain and France. This particular pass is about $700 per adult, but it more than paid for itself by the end of our trip, and the convenience of not having to queue up to buy tickets in each station was invaluable. The pass does not give you seats on the high-speed trains, you still have to reserve and pay for those seats, but it saved us a bundle; local trains do not offer reserved seats, but those were free with the pass. One leg of our trip, from Barcelona to Toulouse, for example, would have been about $160 each without the pass, and was about $17 with it, so that day alone paid for $143 of each pass…you can see how the savings add up! You do need to be diligent about reading the instructions on the pass and following them! Each night before we traveled, I sat and filled out the next day’s date on the pass, and the cities, date and times of each train on the pass folder. It takes only a few minutes, but if you do not do that, you could be double charged for the ticket. Some people have asked if they really need advanced reserved seats… no, no more than you need to reserve a seat on an airplane. You can always take your chance on showing up at the station and buying a last-minute ticket, but many trains (and all high-speed trains) require reservations, and they do sell out. Download Eurail’s free RailPlanner app to use for local, non-reserved trains; it’s easy and gives you departure and arrival times, as well as letting you know if you have a change of train required. With wifi, it will give you live schedule updates, but offline you can see routes you have saved in advance. 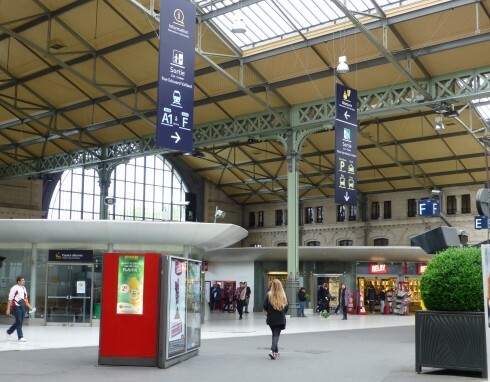 Here’s one time where it really saved us: the posted schedules at Chenonceaux “station” (some tiny local stations are more like bus stops), were entirely wrong due to construction that caused the trains to be rescheduled. Checking ahead on RailPlanner meant we knew to catch the posted ‘4:45 train’ at 4pm, instead of missing it and having to wait for the 6pm train! When you travel, do pay attention to the train number and not just your destination. Our train to Toulouse, for instance, actually continued on, so there was no train on the board that said “Toulouse”… just the departure time, Carcassonne, and the train number. It’s wise to know the name of your arrival station [there are sometimes multiple stations in a town] and what is 1-2 stops before it, so you aren’t scrambling to get to the doors! Like the Europeans, pack as light as you are able. The trains are not easy with heavy bags! Elevators are few and often far off in the wrong end of the station, so you’ll have to double back a long way, or haul your bags down 2 flights, around a corner, up a flight, and down a hallway [or worse], and your seats may be on the upper level of the car…great for views, but more stairs to climb. Keep your passport with your train pass and tickets, as often all three are checked before you are allowed to board, especially on trains crossing a border. If you can get to the station early, scope out where the train boards and gates are. Some stations are huge and it’s comforting to know where you’ll need to be when your train is announced, as you usually will have 15- 20 minutes to find your car from the time the gate is announced. Buy your “Chunnel” tickets well in advance, as there are only a couple of Eurostars each day between Paris and London, and they sell out. A lovely meal is served at your seat, so you can really sit back and enjoy the beautiful countryside. People were almost universally really nice and happy to answer questions, and the views from the trains were really wonderful; even at high speeds you see more than you would from the highways and there is no stress of driving on unknown roads! That’s the summary…you can ask me if you want more details or help planning your own rail journey. And yes, we’d do it again… in fact, rail is absolutely the only way the two of us would choose to get around inside Europe.